Our visit to the Kowloon area of Hong Kong marks the second in the trilogy of DVD programmes from our visit in late 2013. As before there have been a number of changes to the bus scene since our previous visit in 2012. KMB have introduced the new ADL Enviro 500NG (New Generation) onto many services as we can see on this programme. Citybus have also introduced the ADL 500NG into their Cityflyer and main fleet. There are new ADL Enviro 200 single door saloons within their first few weeks in service with KMB – a new departure as most KMB vehicles are dual door. Probably the most important feature of this programme is the appearance of eight special liveried vehicles celebrating 80 years of KMB. There are four Wright Geminis an ADL Enviro 500, a Scania/Caetano and two ADL Enviro 400 buses. Each one depicting a livery used in the past by KMB buses. All are featured on this programme – see if you can spot them! Our filming starts on the extremely busy Nathan Road. We film at various locations along this road from Mong Kok, through Jordan to the bottom of the road where it joins Salisbury Road. Most vehicle types are observed here from the three major fleets, KMB, Citybus and New World First. Tsim Sha Tsui Star Ferry bus station is always a good filming location with the skyline of Hong Kong Island in the background, so our cameras spend some time here before we continue along Salisbury Road to Chatham Road South. Our next filming location is at Hung Hom bus station, and then move across the road to witness the evening rush on Hong Chong Road near the Cross Harbour Tunnel entrance and exit. Plenty of action including the recovery of a failed Enviro 500! 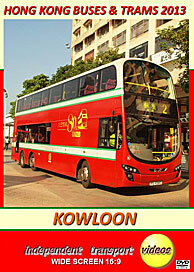 Moving further east we visit Kwun Tong Ferry Pier bus station as the buses return from the early morning rush. Here we can see many of the older white liveried air con Dennis Dragons and Volvo Olympians. Look out for the ‘GP’ registered 12 metre Olympians, they would be withdrawn from service the following day. From the south east of Kowloon, we now move to the north west as we film at the ever busy Mei Foo. Again a good mix of vehicles, including an ADL 400 in the 80th Anniversary livery and some of the Alexander bodied Scania N113’s, which are soon to be retired. We then travel on a brand new Citybus ADL Enviro 500NG, 8357 (SH 5894) on route 102 to Nathan Road. Location filming completes with night scenes on Nathan Road and at Tsim Sha Tsui. To close our programme we present a bonus feature as we pay a visit to the Hong Kong Museum of History to see the exhibition that was put on to celebrate the 80th Anniversary of KMB. We hope you enjoy the show!